Online shopping with computeruniverse does not only mean the maximum service and product choice, but also high security and confidence. 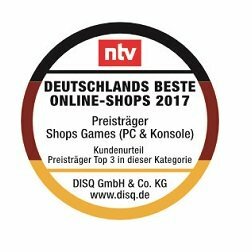 In a large consumer survey conducted by the German Institute for Service Quality and n-tv, the best online shops were determined in 2017. Evaluation criteria were amongst others product quality and variety of products, competence of telephone advice, payment options and delivery options, shipping costs and speed of shipping and handling returns. In the category Games (PC & console), computeruniverse was voted TOP 3 award winner. 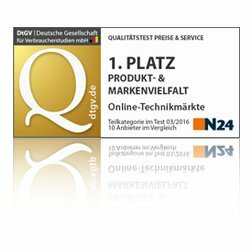 A study of the German society for consumer research (DtGV - Deutschen Gesellschaft für Verbraucherstudien) in cooperation with N24 examined ten online technology stores, which have a wide range of current entertainment and household electronics. In the category of product & brand diversity computeruniverse received the rating "very good"(1,4). For example, the most popular segment "Tablet Computer" lists devices by up to 38 different manufacturers. The independent expert editorial staff of netzsieger.de awarded computeruniverse with the overall rating "very good". 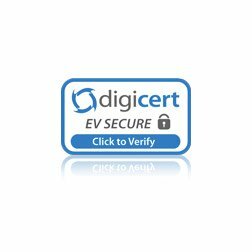 The detailed test report is divided into individual categories (user friendliness, service all, privacy, etc. ), whose scoring is summarized to an average overall rating. 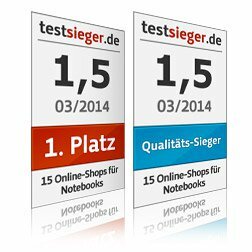 The neutral and independent comparison portal, testsieger.de, named computeruniverse as the best online shop for Notebooks. 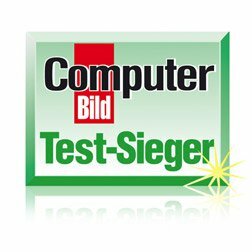 “With the overall grade 1.53 (“very good”), the test champion, computeruniverse, offers its Notebook customers an excellent purchasing experience”, explained testsieger.de as the reason for the result. In addition to the overall victory, computeruniverse also received the award for best service quality. 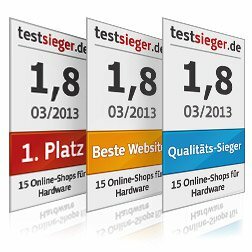 The website Testsieger.de conducted a study of 15 online retailers of hardware . computeruniverse receives with an overall rating of 1,76 three awards. 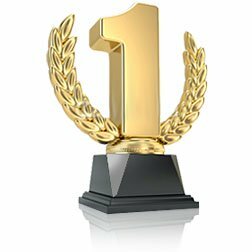 „Besides of the overall winner of all shops computeruniverse can also win the quality award and ´Best Website´. 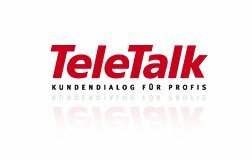 The magazine for Customer Service "Teletalk" published in its issue of March 2013 a special article about the innovative "Full Service Quality Management" at computeruniverse. Here you can download the article as PDF for future reference. 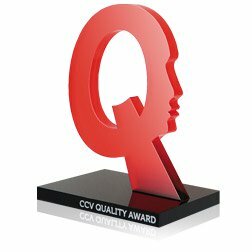 At the CCV Quality Awards for call centers computeruniverse was awarded for “Customer Satisfaction” and is now considered as the best in their line of business. computeruniverse, based in Friedberg, scored with their excellence in the category of customer satisfaction. The lack of scripted dialogues, resulting in free, personal communication, was only one of many attributes of award winner computeruniverse that were explicitly pointed out by the jury for their decision. 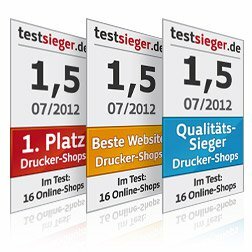 The website testsieger.de conducted a study of 16 online retailers of printers and computeruniverse was the only shop in the study to receive an overall rating of „very good“. 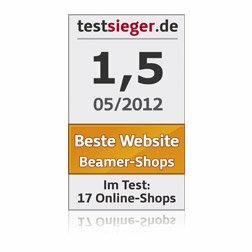 The website testsieger.de conducted a study of 17 online retailers of beamers and computeruniverse receive an overall rating of „very good“. 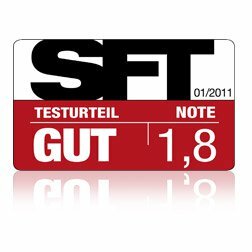 Die Stiftung Warentest vergab in der „test“ Ausgabe 12/2009 computeruniverse das Qualitätsurteil „gut (2,0)“ und somit die beste Gesamtnote im Test. 10 online shops within the sector of consumer electronic/televisions were tested. 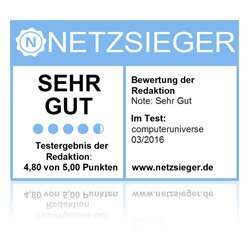 The Stiftung Warentest took 10 online sellers of photography equipment in the test and closely scrutinised them, with computeruniverse.com being chosen for the quality mark of "good" and with the overall mark of 1.7 we became the winners of the test. 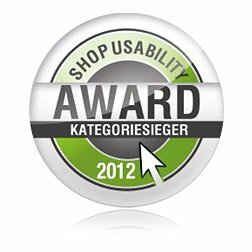 The Shop Usability Award honours user-friendly online shops in Germany. The award belongs to the most requested certification for online shops with more than 400 applications annually. The online shop www.computeruniverse.net took part in the Shop Usability Award 2012 and made it into the award´s top 5 in the category of hardware, software & consumer electronics. computeruniverse is in first place in ComputerBild´s online shop test. The specialist magazine SFT tested 10 online sellers in their 07/05 edition and chose computeruniverse as test winner. 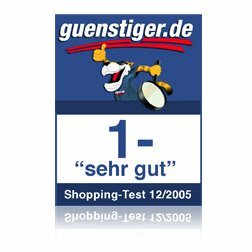 The independent online price comparison site guenstiger.de tested 10 German online shops. (12/2005). The test winner was computeruniverse! Online shopping with computeruniverse does not only mean the maximum service and product choice, but also high levels of security and confidence. To enable us to consistently fulfil the expectations and demands of our customers, we attach particular importance to maintaining high quality standards on our website as well as in handling our orders and processing enquiries and complaints. computeruniverse is certified by Trusted Shops. 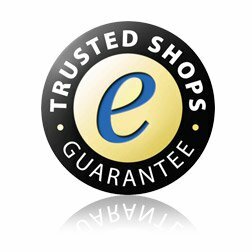 After your order you can request the consumer protection from Trusted Shops. This service is free with computeruniverse! The Trusted-Shops Seal is awarded from the Atradius Credit Insurance AG (formerly Gerling) and represents the proven security in connection with consumer protection. Strict control is applied particularly in the following areas: terms and conditions, data protection, and management of orders, complaints and delivery. 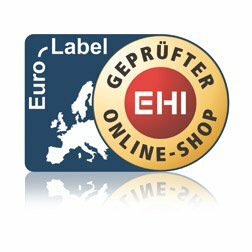 A claim that is represented by the seal of „Verified Online-Shop“ by the EHI Retail Institute e. V (EHI). This seal not only guarantees payment safety and compliance with legal provision such as data protection and long-distance transaction laws, but also transparency regarding the order process in terms of costs and conditions. 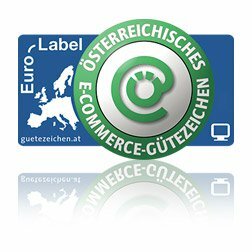 This e-commerce mark of quality was developed due to the initiative of the Austrian Institute for Applied Telecommunication. The aim here is also to make serious online shops recognisable as such upon first glance and to consequently facilitate safe online shopping. Compliance with award criteria is regularly checked and ensures a customer friendly business. Quality, security and service are important criteria, which an online merchant must fulfil. Our shop is reviewed by CHIP Online to strengthen confidence in online merchandising. 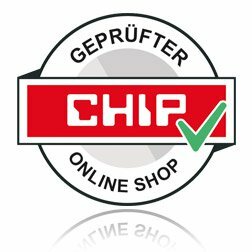 All partner shops have signed up to fulfil the quality criteria set by CHIP Xonio Online GmbH with regards to security, service and commitment. So that your personal data is not transferred unencrypted (‘interceptable´) over the internet, we encrypt your orders using SSL. (TLS 1.0, SHA1+RSA with 128/256 bit encryption (high); RSA with 2048 bit exchange.